If you’re looking to redesign your child’s bedroom this year, then there are plenty of popular trends to opt for. Nowadays, children seem to want their bedrooms to be big, bold and brash, with popular and eye catching designs. As a parent, this can be worrying as it costs you both in terms of time and money. However, when designed properly, you can create a space your child will love for years to come. With this in mind, and if you’re thinking of experimenting, here are the top children’s décor trends for 2016. For the pirate adventure playroom, space is essential. That’s why, if you’ve got more than one child, you should really look at beds that will save space, like bunk beds. By creating space in the centre of the room, you’ll leave lots of room for play and activities such as treasure hunts and ship battles. By blending sea blues with sandy creams, you’ll create the perfect beach island effect. Drawers and toy chests can take the shape of treasure chests and maps can adorn the wall to help your kids strike gold. 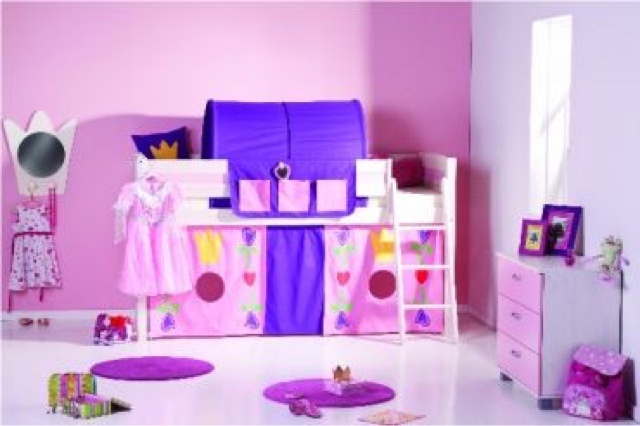 If you’ll always think of your little girl as your little princess, then a princess castle is a great conversion for a bedroom. Filling the room with pretty pinks, soft whites and egg shell tones can really make the room sparkle, as can complimenting it with diamante finishes, chrome furnishings and posh netting curtains. You’ll be able to create a palace fit for your princess. With the release of the latest Star Wars film at the end of last year and a British astronaut now in space, space is all the rage among children who want to learn about the universe and the planet they live on. Space requires dark tones, which isn’t such a bad thing in a bedroom as it’s ultimately where your child will be required to sleep. To stop the room from appearing too dark, opt for silvers and greys rather than dark blacks, and ensure that there’s plenty of wall lighting an up lighting. This look is best recommended for rooms that get a lot of natural light, too. Finally, if your child loves the Jungle Book or Tarzan, consider a jungle inspired adventure room. This will be dominated by greens and browns, with stencil art looking great and completing the look. Add trees, shrubbery and, if possible, even animal art to the wall. Your child will feel like they’re in the deepest, darkest Amazon. So there we have it, the top children’s décor trends for 2016. Which one will you choose?